Until 1890, Belmar was known as Ocean Beach. In the Year of Our Lord 1888, a Catholic mission was established in Ocean Beach. A small wood frame chapel was built on Second Avenue to accommodate the increasing number of Catholics in the area who wanted to attend Mass. Our first chapel was a mission church of Holy Spirit Parish in Asbury Park. In fact, the whole coastal area from West End to Point Pleasant was under the care of Father Michael L. Glennon, the pastor of Holy Spirit Parish in Asbury Park. This chapel was only open during the summer. During the rest of the year, the full time residents of Ocean Beach had to attend Mass in Asbury Park. Shortly thereafter, some property was purchased for a more permanent church on the corner of Seventh Ave. and E. Street. The cornerstone for the new church was laid by the Most Reverend Michael 1. O'Farrell, then Bishop of Trenton, in 1890. The Parish was officially incorporated on December 28, 1897. On the certificate of incorporation, the Rev. Dr. John W. Norris was named as Rector with Thomas Dillon, who served as a Trustee until 1937, and Martin Connolly as lay trustees. Father Norris was then the pastor of the newly formed Saint Catharine's Parish in Spring Lake and we had become a mission of Spring Lake instead of Holy Spirit Parish in Asbury Park. Early on, two priests from Seton Hall College, South Orange, served the parish especially on weekends with the celebration of Mass. They were Fr. John 1. O'Connor, who was to be the future Bishop of Newark and Fr. Joseph 1. Synnot, who was later to become the President of Seton Hall College. The first resident pastor was the Rev. Thomas B. Nolan, appointed in 1902. After the larger wooden church was opened where the present church now stands, Father Nolan's task was to build a rectory. The first wedding in the parish was held on September 20, 1902 for Mary Doyle and James Doran. The first child baptized was Margaret Mary Zierold on December 6, 1902. Father Nolan passed away on September 21, 1905. Our next pastor, Rev. Msgr. William 1. McConnell was to spend 27 years at Saint Rose and accomplished much during some difficult economic times. 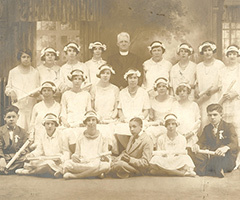 The Rosary Altar Society was formed in 1906. Msgr. McConnell's broad vision of the future of Saint Rose Parish led him to perceive the need for not only a Parochial elementary school but a high school as well. In 1921, Saint Rose Elementary School was opened in "the red brick building" as it is commonly called. It was later to be called "McConnell Hall". It was dedicated on November 13, 1921 by the Most Rev. Thomas 1. Walsh, then Bishop of Trenton and later Archbishop of Newark. In 1923 Saint Rose High School began in "the red brick building" with 34 freshmen. 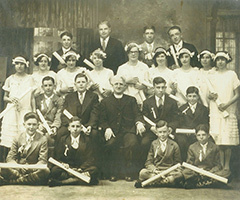 The first graduating class of the high school was the "Class of 1927". At that time there were only 120 students in the combined grammar and high schools. Msgr. McConnell had to obtain the services of a community of Sisters to teach in both schools. It was our good fortune that he was able to obtain the services of the Sisters of Saint Joseph from Chestnut Hill, a suburb of Philadelphia. Msgr.McConnell soon realized that the wooden church was not able to accommodate the increasing number of people who were coming to Mass at Saint Rose, especially during the summer months. In fact a theatre building had to be used for the celebration of Mass during the summer months. Another accomplish­ment of Msgr. McConnell was the building in 1926 of the present Gothic church which has a capacity for 500 people. The stained glass windows for the church were obtained in Austria where Msgr. McConnell had done his theological studies. Mr. Henry Herberman donated the magnificent organ in the church. The solemn dedication ceremonies took place during the summer of ] 926. Bishop Walsh presided on this occasion. In the spring of 1932 Msgr. McConnell was transferred to Our Lady Star of the Sea Parish in Long Branch. Fr. Kimball was appointed by Bishop McMahon, the Bishop of Trenton, to be the third pastor of Saint Rose Parish in 1932. When he arrived in Belmar, he was not in good health and was transferred to Our Lady of Lourdes Parish, Milltown in 1934, where he passed away in 1937. In the Spring of 1934, Fr. Welsh, who had been associate pastor at Holy Spirit Parish in Asbury Park was appointed as the new pastor of Saint Rose by Bishop Moses E. Kiley, the new Bishop of Trenton. Fr. Welsh was fond of the theatre and began a Passion Play with the members of the parish. Fr. Welsh left Saint Rose on June 28, 1937 to assume the pastorate of Sacred Heart Parish in Riverton. Within a year after the arrival of our fifth pastor, the parish celebrated its Golden Jubilee on Tuesday, August 30, 1938. The statue of Our Lady, which was moved from the rose garden behind the Rectory after the fire of July, 2001, and is now situated in the walkway between the New Parish Center and the west side of our Church, was originally in front of the former wooden church. It was for a time in the courtyard of the high school and used during the month of October, weather permitting, for the evening recitation of the Rosary. The Statue of the Blessed Virgin was a gift to the people of the parish by Fr. O'Sullivan in memory of his parents. 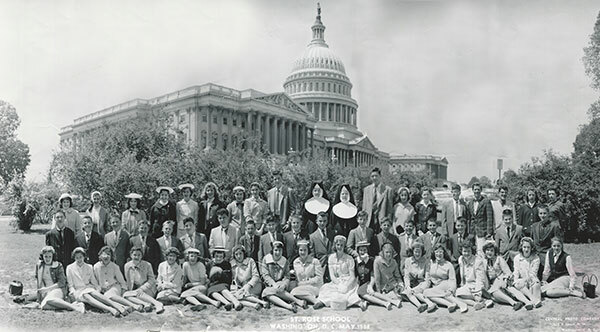 With the increasing enrollment, classroom space became scarce' and the high school had to be enlarged to include not only the old church hall but rented space in what became the old borough hall located on 8th Avenue and Highway 35. This prompted some of the Sisters and students to refer to Saint Rose as "The University" because it was scattered in so many buildings. The cafeteria for the school was then located in the basement of the convent. Fr. O'Sullivan died in the rectory on December 15, 1949. The 25 year pastorate of Msgr. Teston was marked by a period of real growth and prosperity in terms of increasing enrollment at the schools and in the number of parishioners. In 1950 when Msgr. Teston became pastor, there were 290 students in the high school; when he left in 1975 that number was at 800. During this time Msgr. Teston oversaw the expansion of what is our present high school. In 1957 the ground floor was used by the grammar school; the 2nd and 3rd floors were used by the high school. In 1968 the new grammar school opened at its present location on Sixth Avenue. Msgr. Teston retired as pastor of Saint Rose in 1975 due to ill health and moved to Stuart, Florida. He died on April 22, 1976. Msgr. Alfred D. Smith, the rector of Saint Mary's Cathedral in Trenton was appointed pastor of Saint Rose in July, 1975. Msgr. Smith renovated the church during 1978, especially the sanctuary, to bring it in line with liturgical norms established by the Second Vatican Council (1962-1965). The side altars were removed and the statues were placed on wall pedestals. On the night of June 22, 1980, a tragic fire burned and destroyed Saint Rose High School Gym and cafeteria. Were it not for the fact that it was a night with little wind, the whole complex could have burned. Msgr. Smith immediately assumed the task of rebuilding the structure. The new gym and cafeteria was blessed and opened in 1981, a little more than a year after the fire. On July 27, 2000, Msgr. Smith retired and moved to Saint Bonaventure Parish, Lavallette, New Jersey. Msgr. Ladzinski, Pastor of Saint Aloysius Parish, Jackson, New Jersey was appointed Pastor of Saint Rose in July, 2000. During his tenure at Saint Aloysius, Msgr. oversaw the building of their school. At his previous assignment at Saint Joseph's in Toms River, Msgr. was given the task of building a new church, which was accomplished in 1993. His experience proved invaluable in July, 2001 when fire destroyed the Rectory at Saint Rose. After months of assessing the needs of Saint Rose Parish, evaluating our options, taking stock of our resources and projecting what the future holds, Msgr., together with a committee of parishioners, developed a plan to address our needs and to provide for Catholic parish life in our community for the generations which will follow us. Plans were made for a three story building to include substantial gathering space on the lower level; offices for lay ministries, priests, deacons, pastor and other pas' Jral support staff on the second level. Also included would be handicapped accessible restroom facilities for our parishioners' convenience. A residence for our priests would be on the third level. Fr. Freer was named Pastor of St. Rose Church on June 19, 2009. Having been ordained to the priesthood on May 19, 2007, Fr. Freer served as administrator at Holy Family Church, Union Beach before being assigned to St. Rose. Msgr. Arnister was installed as Pastor of St. Rose Church on August 21, 2011. Having been ordained to the priesthood on May 19, 1979, Msgr. Arnister served in the diocesan Chancery Office as vice chancellor of the diocese and master of ceremonies to Bishop Reiss. Msgr. Arnister served as Pastor of Holy Cross Parish, Trenton before beginning is Pastorate at St. Rose Church. Fr. McConnell, the second Pastor of Saint Rose Church, obtained the services of the Sisters of Saint Joseph from Chestnut Hill, a suburb of Philadelphia, Pennsylvania. The first four Sisters who were missioned at Saint Rose in 1921 were: Mother Roberta, Sisters Joseph Augustine, Pancratia and Rose Bernice. They first lived at 306 River Road near Third Avenue until the present convent could be built in 1923. The new convent was dedicated on December 18, 1923 by Bishop Walsh. From the Constitutions of the Sisters of Saint Joseph: The Sisters of Saint Joseph of Chestnut Hill, Philadelphia, are women religious who have freely responded to the call of the Holy Spirit to lead, within the Church, a life in community dedicated to the glory of God, to continual growth in Christ, and to the loving service of all without distinction.